Superior performance — Mitsubishi Electric products are reliable, super-quiet and deliver consistent temperature distribution. Economic — Mitsubishi Electric ductless air conditioners and heat pumps have high SEER ratings, with inverter technology. Maximum comfort — Mitsubishi Electric products are equipped with an anti-allergen and odor air filter and deliver total control over the temperature in your indoor environment. Mitsubishi Electric Cooling and Heating leads the way in producing green technology products. With our Mitsubishi Electric ductless heating and air conditioning systems, you do not have to choose between comfort and environmental responsibility. Ductless air conditioning and heating delivers maximum comfort with minimal electric usage. Recyclable components. 81 percent of the parts used in Mitsubishi Electric ductless units are recyclable. Inverter technology. Conventional systems run at a constant inefficient speed; however inverter technology is a self-adjusting technology that saves on power and energy. Inverters receive a steady stream of information from sensors that monitor room conditions. As this information is received, the compressor adjusts its speed to supply only the amount of power needed, thus reducing excessive consumption of electricity. R410A refrigerant. R410A refrigerant contains no chlorine, which means it causes zero depletion of the ozone. 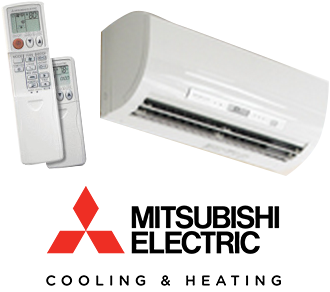 We are honored to be a Mitsubishi Electric contractor and Dealer, because Mitsubishi’s heating and cooling products deliver ultimate indoor comfort and are unsurpassed in quality and performance. Please consider Air Dynamic Systems your best choice for installing a new ductless HVAC system.